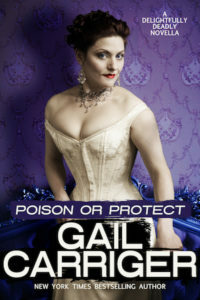 Parasol Protectorate | Moonshell Books, Inc.
A Delightfully Deadly novella of 45,000 words, proofread by Moonshell Books, Inc. in June 2016. New York Times bestselling author Gail Carriger presents a stand-alone romance novella set in her popular steampunk universe full of manners, spies, and dainty sandwiches. Lady Preshea Villentia, the Mourning Star, has four dead husbands and a nasty reputation. Fortunately, she looks fabulous in black. What society doesn’t know is that all her husbands were marked for death by Preshea’s employer. And Preshea has one final assignment. It was supposed to be easy, a house party with minimal bloodshed. Preshea hadn’t anticipated Captain Gavin Ruthven – massive, Scottish, quietly irresistible, and… working for the enemy. In a battle of wits, Preshea may risk her own heart – a terrifying prospect, as she never knew she had one.